The 1,200-room Marriott Marquis hotel adjoining McCormick Place, Chicago. It’s still a huge market for leisure—entertainment, retail, hospitality, and mixed use. But the form leisure takes reflects local and regional differences, even as it takes cues from everywhere else. North American cities are open and diverse, and yet protective of their traditions. Leisure responds by both adapting to and influencing everything it touches. We spoke with Gensler designers from coast to coast to understand how leisure’s themes and trends play out. Here’s a report on what they told us. In the North American heartland, the Great Recession hit hard in the Rust Belt; less so in areas cushioned by the energy sector, like urban Texas and Canada. Now, six years later, with manufacturing making a tech-enhanced comeback, the big cities around the Great Lakes are rebuilding and redefining themselves. Midwest cities are bouncing back. Energy-fueled Texas (and Canada) are powering forward. As city centers attract new growth, the suburbs are being remade as regional mixed-use destinations. Density is activating leisure, making cars less important and local flavor and experience more so. “Chicago is seeing phenomenal growth in hotels,” says Wesley LeBlanc. “It benefits from being both a business and leisure market, with leisure on the rise,” supported by Mayor Rahm Emanuel’s Choose Chicago campaign to boost tourism. A prime example is the 1,200-room Marriott Marquis planned next to McCormick Place, North America’s largest convention center. Connected to it by bridges, the 54-story hotel will breathe new life into the South Loop—“adding a new park and a 24/7 mix of retail and entertainment that locals and conventioneers can share,” Lamar Johnson explains. The tower’s modularity and materiality fit with the Chicago skyline. Chicago’s Timbuk2 store is a prototype for a US expansion that will fit the brand with its urban locations. The West Loop is also changing as tech moves in, taking advantage of great transit access—a new CTA station—and the ability to reposition a former meatpacking district into a vibrant work, living, and leisure setting. Kyle Davis, who’s working with a Chicago developer to reposition a late 19th-century warehouse building, credits a filled-up downtown with pushing development west. “There’s a tremendous migration, but the pull is the district’s history.” That authenticity speaks to a big trend on the Third Coast: that leisure and work are increasingly joined at the hip. Meanwhile, in Texas, North America’s new energy profile has sparked the Houston and Dallas metropolises to transform themselves from a leisure standpoint. Tech-fueled Austin, building on its music scene, is also burnishing its reputation. For car-centric Houston, the big news is what planners call “walkable urbanism.” The city’s suburban nodes are turning into denser, more robust places with a much more citylike combination of components. This is visible in Houston, where outdated neighborhood centers and strip malls are being rebuilt at an urban scale. River Oaks, a 250,000-square-foot development, is an example, shifting away from horizontally separated uses toward synergistic, pedestrian-friendly ones. Density packs more in. “Developers recognize that land is a limited resource and that reinforcing a sense of community makes places attractive and profitable,” says Peter Merwin. 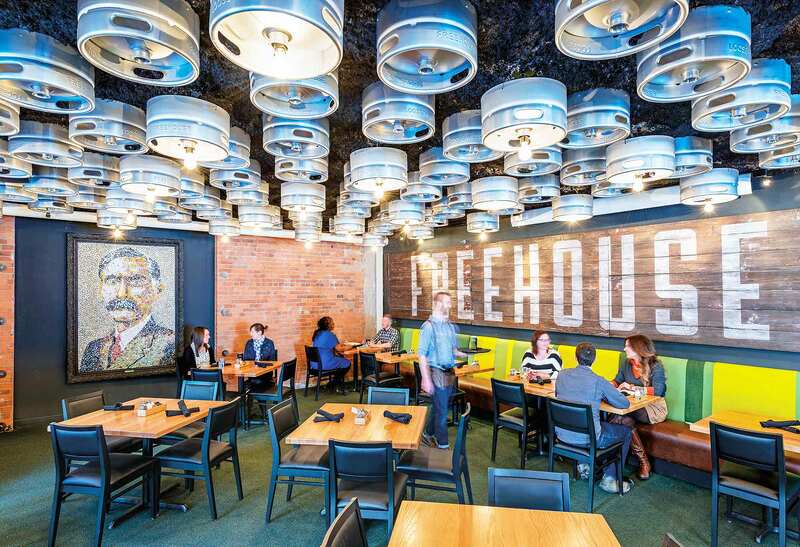 The Freehouse in Minneapolis celebrates artisanal beer brewing. Merwin adds that a 250-acre city-in-a-city is planned for Houston’s west side. Its 7.6-million-square-foot program is set out as distinct neighborhoods to give residents and workers multiple reasons to get out and explore. A green armature of open space—organized around transit—links the different parts, including one of Houston’s leading medical centers, to form a complete community, he explains. The Dallas Cowboys’ Jerry Jones has teamed up with the City of Frisco and the Frisco Independent School District on a Multi-Use Events Center that hosts city and district events, gives local high schools a playfield, and adjoins the Cowboys’ headquarters. “It even has a main street their bands can march down,” says Ron Turner. Public bond money is partially paying for the Events Center part of the project. Live music is a theme in Austin, and it’s not just marching bands. The music scene goes hand-in-hand with an urban university and a tech-driven economy. “It makes for a quirky, eclectic vibe,” says Todd Runkle. It’s also thriving, with new development ranging from a 1,000-room Fairmont convention hotel—crisply modern but incorporating local materials—to a 30-key boutique hotel that will feel almost handmade. Like Dallas and Houston, the Austin city edge is getting an urban feel. David Epstein describes the latest evolution of an old tech campus that’s becoming a mixed-use center: “Our model for The Domain is downtown Austin’s Sixth Street—a place that’s rough and authentic. It’s also hackable, designed to allow retail tenants to put their stamp on it.” With new housing, a hotel, and a community park, this is “instant urbanism,” he says, “but the architecture is relaxed, open to self-expression over time, just like the music.” And just like Austin itself, he might have added. Aryn Beitz is a Gensler editor based in New York City and a contributor to Design Bureau. A look into a designer's early inspirations. Leisure speaks in the language of its city and culture, with a spirit that brings it alive, authentically of its place.